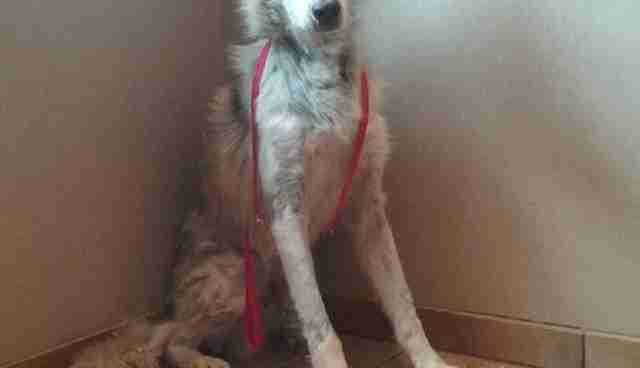 Late last week, "New Boy" was a stray, roaming the suburbs of Los Angeles. At one point, he might have been someone's pet, because he had something that resembled a collar on him when he was picked up by a local shelter. From a distance, it was easy to think that New Boy was just another stray dog. But his true nature quickly became clear to his rescuers. 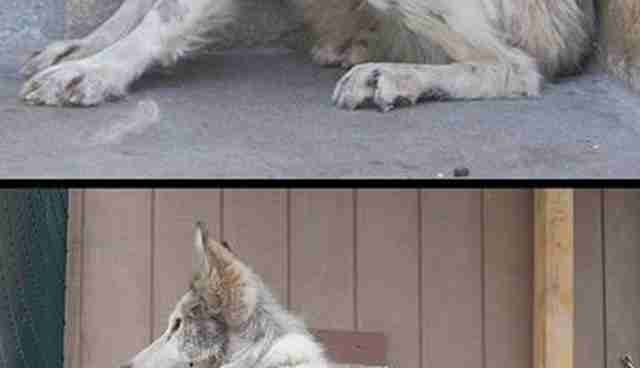 He was no ordinary house pet - he was a wolf dog and he was in need of saving. Otherwise it was more than likely he would be euthanized by the shelter, which couldn't keep a wild animal and didn't have the resources to give him the care he needed. 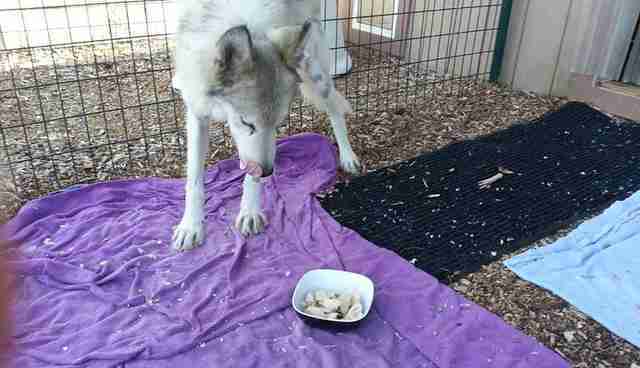 After reaching out to wolf and wolf dog rescues in California, which didn't have enough room to take in New Boy, the shelter that picked him up reached out to a national network of wolf rescues. That was how Colorado's W.O.L.F. 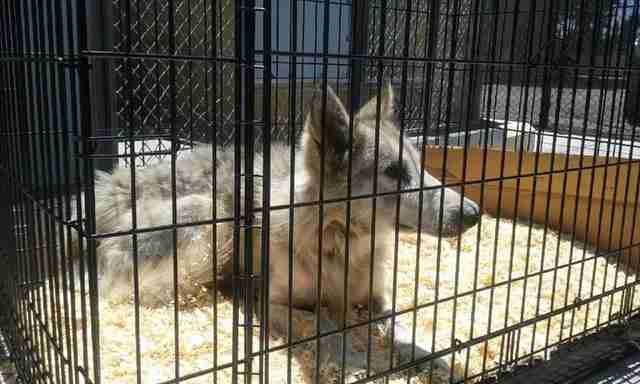 Sanctuary first heard about the young wolf dog, who's about 1. 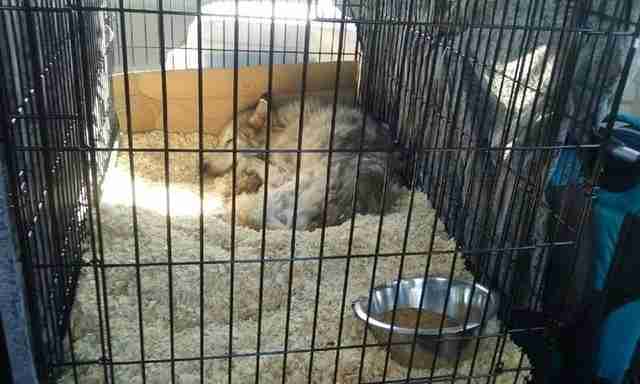 "He obviously had not been taken care of very well for awhile," Michelle Proulx, director of animal care at W.O.L.F. Sanctuary, told The Dodo. "He is in very, very rough shape, physically." 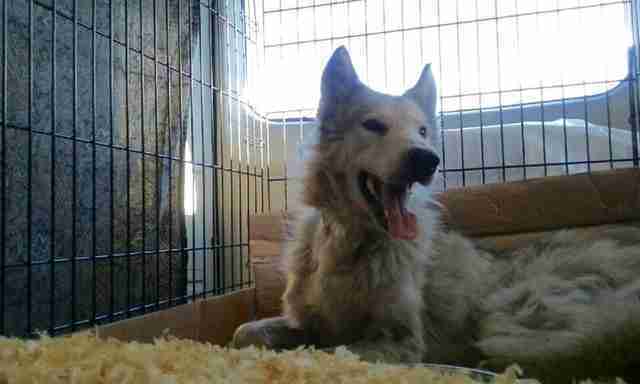 New Boy was emaciated, dehydrated and filled with parasites and had developed a severe case of mange. W.O.L.F. Sanctuary staff saw photos of the young pup, despondent and obviously frightened. 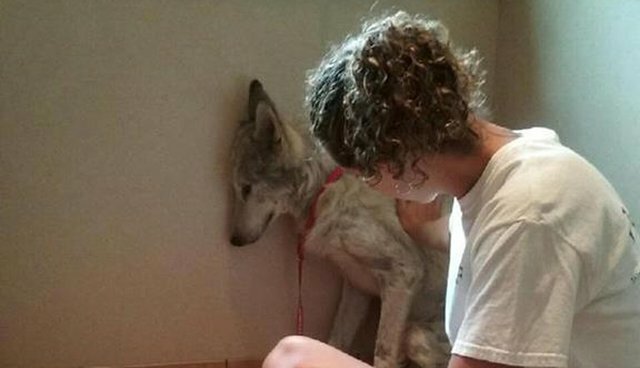 The sanctuary happened to have room to give the wolf dog a home and immediately put together a group to move forward with picking him up. The drive from California back to Colorado was around 18 hours, but on Monday, New Boy was officially in safe hands and ready to start his new life. He checked into the Wellington Veterinary Hospital early Monday morning, where an examination determined that in addition to his other health issues, New Boy was anemic, had inflamed feet and was covered in ticks. After getting cleaned up, New Boy was transferred to an off-site infirmary, where he'll remain for about two weeks until he is healthy enough to join the sanctuary. "When we first met him he was extremely timid and very scared," Proulx told The Dodo. "When people would come around, he would try to get in the farthest corner away that he could. He would look for escape routes, try to find his way out of his enclosure so he could get farther away from the people coming [into his room]," she said. Although New Boy's only been with his current company for a few days, Proulx noted that he's slowly starting to relax a bit. "I think he's starting to realize that it's going to be okay," she said. "We're not seeing the same intensely fearful animal that we met initially on Sunday." According to Proulx, most wolves and wolf dogs kept as pets typically end up dying before before the age of 2. "The reason for that is because wolves are not dogs, and wolf dogs are not dogs," she said. "People don't realize that when they go out to get them as a pet ... People tend to give them up because they're not easy pets." 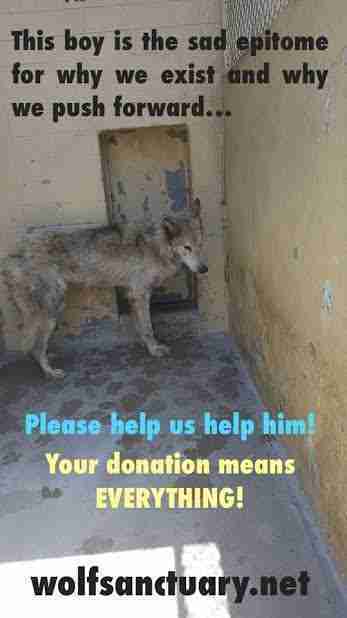 When wolves or wolf dogs start to show their owners their wilder instincts, they are often abandoned - which may have been the case for New Boy. Nothing about his background before his rescue is currently known. "Once we get him treated to the point where he is healthy enough to come up to the sanctuary, what we'll do is actually look to rescue a young female to be a companion for him," Proulx said. "We keep our groups at the sanctuary small, two to three individuals maximum so that we can prevent fighting and confrontation issues within social groups." For now, New Boy is continuing to build up his appetite - and learn that the people surrounding him now have nothing but good intentions for his well-being. "He's a very adorable, special little boy," Proulx said. Are you interested in helping with New Boy's medical costs and supporting the work of the sanctuary? See how you can contribute here.